Things to do in Arenal and La Fortuna, Costa Rica. One of most popular activities in and around Arenal is visiting one of the natural hot spring sites and soaking in the thermal water. Resorts including Baldi Hot Springs, Ecothermales Hot Springs, and the famous luxury Tabacon Hot Springs funnel the natural springs into their facilities with manmade waterfalls, waterslides, and many pools with varying temperatures. Most locals opt for the free Tabaconcito Hot Springs, which run through a natural river with waterfalls. People often bring their own picnics and drinks and hang out for the day in nature. 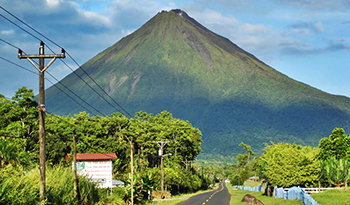 Many tour companies in La Fortuna lead expeditions into the national park for views of the Arenal Volcano. After laying dormant for two years, the volcano is now showing signs of erupting again, although infrequently. A popular option is to take the Arenal Volcano night hike with a chance to see lots of nocturnal animals and emerald green hot springs. The Cerro Chato hike is much more strenuous; it is a 2-3 hour hike uphill, which leads participants to the lake inside the crater. At the top are views, on a clear day, across the San Carlos Valley and the Arenal Volcano. Package tours are available for trips to the waterfall along with the national park and often include bathing in special healing mud in the jungle. The trail to the waterfall moves through grassy fields and through rainforest and has many tropical animals like toucans and monkeys. It can be done on foot or horseback. Lake Arenal is considered one of the best places in the world for windsurfing. The shallow, warm water provides ideal windsurfing conditions and even the strong winds remain stable. It’s possible to windsurf with just one sail size the entire day. Shops around the lake rent basic equipment and offer lessons for beginners.